Every country has its own cuisine, but within each country there are different regional dishes. Do you know of any regional dishes in your country, or abroad? In Spain we have a well respected cuisine, nowadays cooking tv programs are fashionable, I think this trend is positive, at least is entertaining. One of the most famous dishes is the spanish omelette, just a few ingredients, easy to cook, but.... thousands of different results and tastes depending on the cooking, salt, quality of the potatoes, but specially, the sort of oil you use. Oil is frecuently used in Spain, but not so in the UK, am I right? I hate to say it @Camvel, but I really like foie gras, despite what all the vegetarians say. And @mauser, Spanish cuisine is wonderful. My friends in Madrid showed me how to make the best breakfast from tomatoes, grated onto toast with a bit of sea salt and olive oil. In Nice, the signature dish is unsurprisingly called Salade Nicoise. It is not any old common or garden, bog standard salad, but is a hearty meal in its own right. Ideally made with fresh tuna, tinned tuna is fine. It's quite adaptable too. 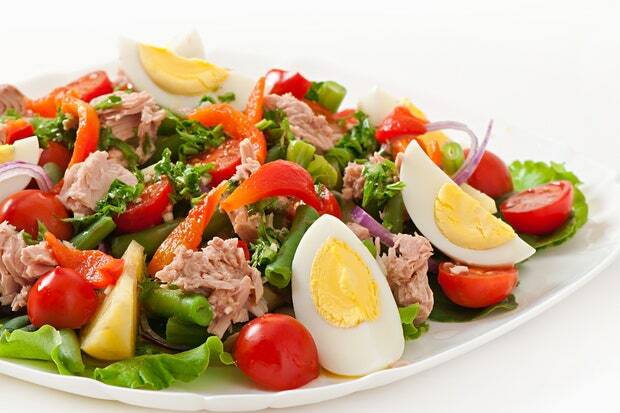 Olives, anchovies and boiled egg are essential (dressed with a vinaigrette sauce), but then the salad can include boiled potato, tomatoes, green beans, lettuce or whatever you fancy. I like natto, fermented soybeans, and eat it everyday. But most people who live in western region in Japan hate it. They wince at its sticky texture and pungent smell, which I love it because of. In my town, people eat meat pie and mushy peas. It's not a dish that I like particularly, as it's very unhealthy, but it is certainly what people would think about when my town name is mentioned. @Lynne, thanks for the video. And, yes of course my family likes it too so much. I'm a big fan of udon. But recently, I'm beginning to like soba too. Yellowtail is right when he said the Yakisoba in the picture was not actually what we call yakisoba. Not just the noodles it used but I don't think it's not that popular to put broccolis in it. I don't mean to deny it though. I know well the Salade Nicoise and I found it fabulous. It's a gourmet but balanced dish (however, the Foie Gras is not really dietetics). I read that for 100g of Foie Gras, it's necessary to run to 3km for eliminate all the calories ! I eat foie gras once in a blue moon @Camvel. But it is a nice treat. I love the cuisine of the south west of France. It's not just duck livers I like, but all the other dishes with duck like confit de canard and maigret de canard. I like pancakes too. But it takes a little time to cook, plus it gets kind of messy so you're going to have a lot to clean up, that's why I don't make pancakes very often. That looks absolutely delicious. I often try to make dishes like that for myself, but for some reason it never feels authentic, in the way that it would have done if I'd eaten it in another country. Yes, I agree with you @mheredge ! All dishes with duck are just delicious. I'm not sure what is typical food in Berlin. I've found a nice Thai place near where I'm staying so have been eating here. Their wi-fi works well too. I think tonight I will make something with udon noodles. I have a few prawns so I'm sure I can rustle something up. I have Nasi Lemak (means Fatty Rice in Malay) for breakfast five consecutive days. It's a typical food in Malaysia. You can find it anywhere anytime here. 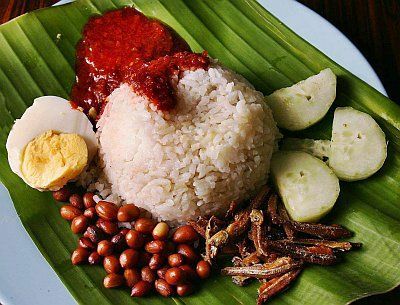 The composition of Nasi Lemak is very simple. the coconut milk cooked rice is eaten with cucumbers, peanuts, fried anchovies, boiled egg and special made spicy sauce. That looks rather nice @chyijung, though I'm not sure I'd want it every day. In Brittany, they are famous for their galettes. These are very large pancakes. They are sold pre-prepared in packages and I had one this morning which I cooked up with some ricotta cheese, prawns and an egg. I wasn't sure that this combination of ingredients would work but it tasted good. That sounds really nice. I like eating savoury pancakes, but most people in England only really have them sweet. @mheredge Well, I should not have it everyday. Spicy food can be a bit irritated to the body. I started to feel dyspepsia and pimples started popping out. I have a lot of Nepalese friends who complain to the same problem @chyijung. They eat rice and vegetable curry for almost all meals every day. I find it very monotonous. @mheredge The same goes here. The restaurant I went serving Nasi Lemak from breakfast to supper. Luckily there are other restaurant nearby. I can't imagine to eat the same thing all day long. Sounds like an all day breakfast place @chyijung. There are restaurants that will serve full English breakfast all day which is a substantial meal of eggs, bacon, tomato, mushrooms, beans, toast and various other options like sausage and black pudding. No @mheredge .It is different. If I see a menu as you mentioned above, I know it is breakfast. But I can't tell if Nasi Lemak is breakfast, lunch, dinner or supper. It is eaten all day long. I like hot and spicy food. What does a typical breakfast look like in your country? In Japan, people used to have rice, fish, miso soup, and several kinds of pickles for breakfast. Now, it's become really diverse. My country, Malaysia is a multiracial society, consisting mainly of Malay, Chinese and Indian. So the food are also very diverse, depends on the population of the people who live there. Malay has the largest population in Malaysia, their usually have rice with different kinds of curry for breakfast. I'm impressed by the wonderful local cuisine of Genoa. Apart from having a special recipe for pesto, the recipes of Liguria are delicious, with lovely fish dishes, special pastas, foccacia, olives - the list is endless.